HandyPro is unlike any other program in the country. At HandyPro, the difference is that we are committed to providing our franchisees with the highest level of personalized service and systems. You will always have the benefit of dealing directly with the people who have made a success in the handyman business. HandyPro’s concept is a comprehensive management system which provides ongoing training, support and guidance to all franchisees. Our staff will work directly with you to insure your business will be up and running successfully within the first 60 day’s of training. Fixed Royalties: Ask about our fixed royalty program, which will allow you to make a higher income. Guarantee: Ask about our HandyPro Guarantee. A guarantee that no one else can offer! That’s how sure we are of your success. In Depth Training: HandyPro Franchisees are taught how to run a business first – from the ground up. Then they are trained how to run a profitable HandyPro Business. A manager is with you at your Grand Opening for the first two weeks to support you. This is a management business. Minimum Investment: HandyPro Franchisees minimum investemt is $35K. The average territory in 100,000 homes in metropolitan markets. And: No Inventory, No Accounts Receivable, No Trial and Error. HandyPro is a proven system. 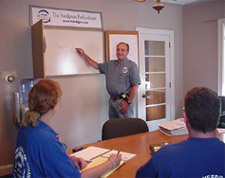 Your “turn-key” handyman service business includes training at a comprehensive training school complimented with your HandyPro Operations Manual, Employee Policy Manual, HandyPro customer Presentation Material, complete proven advertising program, ongoing professional support and annual meetings. At HandyPro, we give you, everything you need to get a Running Start! To learn more about the HandyPro home improvement franchise opportunity, simply complete the form below.